This May, give back to all the mighty moms in your life with a Mother’s Day celebration. 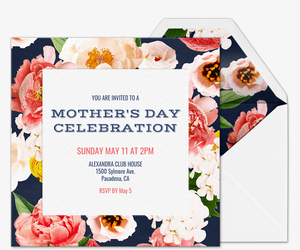 Start the Sunday celebrations with help from Evite -- choose from dozens of our free and Premium digital invitations for every kind of event and mom. Once you’ve picked your invitation, fill in all the party details and provide any extra information in the “Message from Host” box. Whether you’re planning a big family breakfast or a ladies’ spa day, keep guests in the know about what to wear or bring. Make Mother’s Day memories she’ll treasure forever. 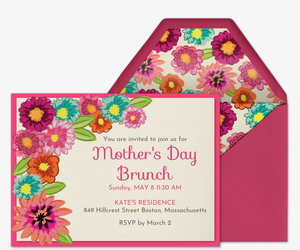 Choose from Evite invitations inspired by a few of our favorite activities for Mom. Plan a special Sunday morning with Mama in pajamas using our free breakfast in bed invitation or set up a “mommy & me” crafting party with the kids. Catching a break? 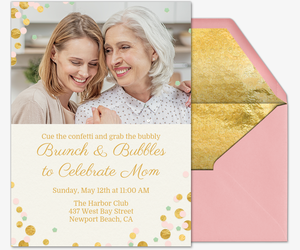 Gather fellow moms for your well-deserved day off -- hit the spa or the beach using one of our relaxation-themed invitations. Or, give back to the everyday superheroes by hosting a charitable event or breast cancer awareness get-together. Through our partnership with Pledgeling, you can also feature a charity of your choice on your Evite invitation to which guests can donate as they RSVP -- just search for your nonprofit on the right side of the event create page. Here’s to all the moms -- new moms, grandmas, daughters, wives, sisters, single moms, two moms and every kind of mom in between. Celebrate all the women you love, no matter your relation, and find the Evite invitation that best pays tribute. 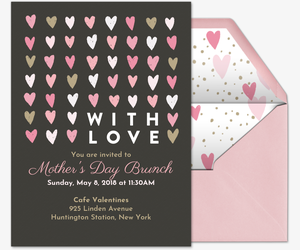 Gather all the wonderful women in your life for a Mother’s Day brunch using our Premium “World Class Mother” invitation or our “With Love” hearts invitation. Or, toast to the tireless moms out there with a boozy brunch or cocktail party. 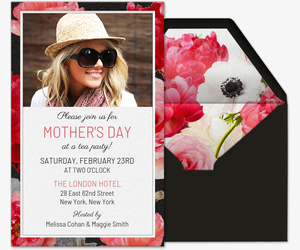 Send out our free “Mom-osas” invitation or our free “Press for Champagne” invitation. 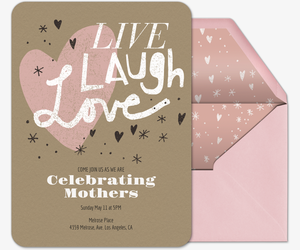 Just want to send a sweet note to say “thanks” or “I love you?” Show Mom the love by sending one of our Mother’s Day cards to all your lovely ladies and including a few words on what you love most about Mom, whether it’s a mother’s bond or her special style. 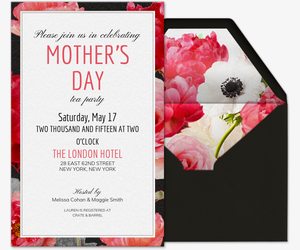 Premium cards and invitations are ad-free and can be purchased with matching envelopes for $12.99 for 15 guests, $24.99 for 50 guests and $49.99 for up to 750 guests. Mama knows best -- but so do we! Head over to ideas.evite.com for expert Mother’s Day party ideas. Make Mother’s Day all about Mom with a picnic in the park or download our printable “Mother May I?” cards as an engaging mealtime game. Or, plan a brunch with your baes using our backyard brunch party guide. Need something noteworthy for the lady of the house this year? Make some of our favorite gifts for Mother’s Day to tell Mom she lights up your life, from a personalized DIY photo candle to DIY match jars. Then put a bow on it with tips from our homemade gift wrap videos.